The CD244 antigen, also called 2B4, is a 38 kDa cell surface signal transduction molecule found on almost all human NK cells. It induces a granule independent killing mechanism by NK effector cells. It is also found on γδ TCR T cells and appoximately half of peripheral αβ TCR CD8+ T cells. It is not found on B or naïve CD8+ T cells. Upon activation, most CD8+ T cells become CD244-positive. 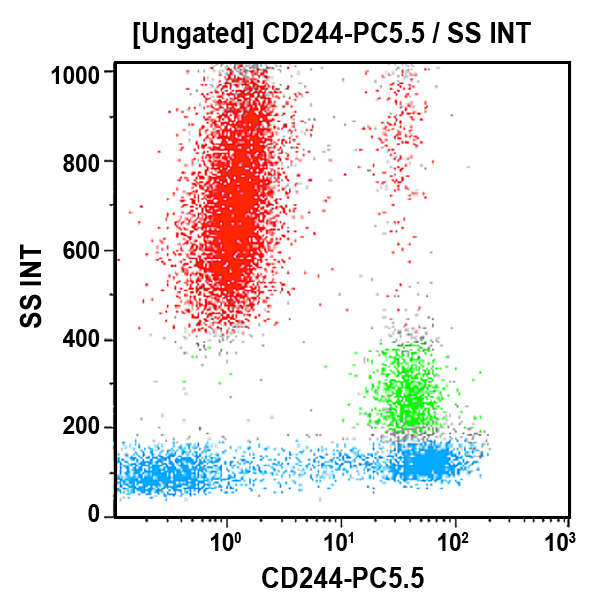 However, a small but significant minority of CD8+ T cells remain CD244-negative. This subset is associated with lower cytotoxic activity, lower γ-IFN production and higher IL-4 and IL-10 production. CD244 is a high affinity receptor for CD48.